After a pause in hostilities for the election, it looks like the favourite climate story of the year has resurfaced. A new poll is out and being covered with the headline that fewer people now believe in climate change or think that it’s an urgent issue demanding attention. There’s some truth in the basic argument that people are now less convinced and worried about climate change than they have been in the past. But when the Guardian runs a story like this, it gets widely noticed and repeated, and there are several reasons why we shouldn’t get too carried away by the news. In February, there was quite a bit of print, broadcast and online coverage for a BBC poll that showed a fall in public belief in climate change. According to the BBC’s numbers, the proportion saying that “climate change is happening and is now established as largely man-made” fell from 41% in November ’09 to 26% in February ’10. A couple of weeks later, the Guardian reported a different poll by the ad agency Euro RSCG. This one showed that the proportion that thinks that climate change “is definitely a reality” dropped from 44% to 31% between January ’09 and January ’10. In fact, the Guardian enjoyed the poll so much, they reported it a second time, two weeks later. So when we hear about yet another poll that shows a drop in belief or concern about climate change between last year and this year, we’re probably not seeing anything new. 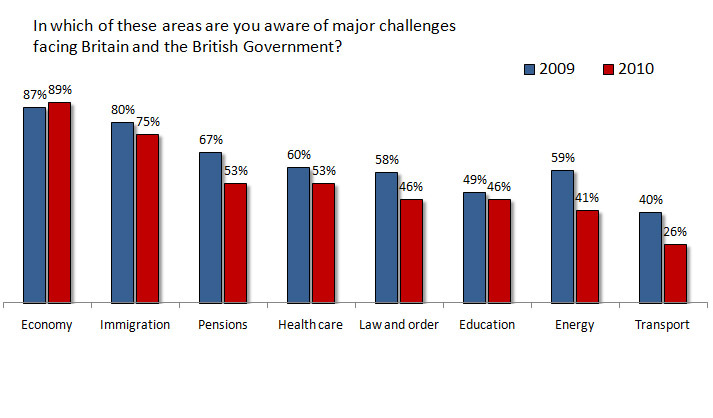 A check of the numbers in the YouGov poll confirms this. The proportion agreeing that global warming and climate change “is a serious and urgent problem” has fallen from 37% last year to 28% this year. This matches what we’ve already seen this year, and doesn’t seem to show us anything new. 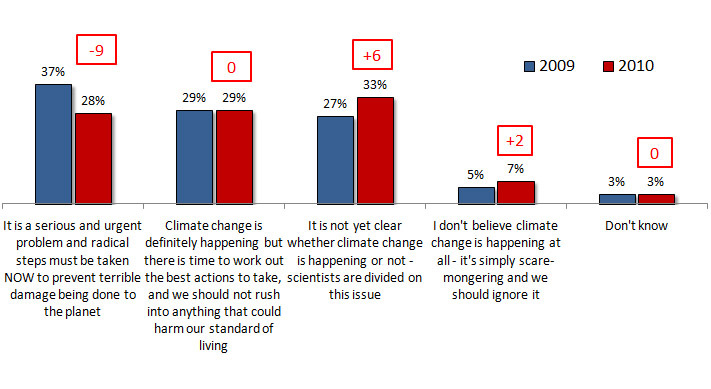 Even after these movements, very few people firmly reject the idea that climate change is happening: in the new YouGov poll, only 7% say that climate change isn’t happening at all. While different wordings of the question can increase this number, what comes across consistently from all the polls is that we are mostly not seeing people switching to thinking that climate change definitely isn’t happening. Instead, there has been some (relatively small) movement from thinking it’s definitely happening to thinking that there’s some doubt among the scientists. So while it’s true that concern about energy has fallen more than about most other areas, the coverage could just as reasonably have been about a drop in concern about law and order or even immigration! 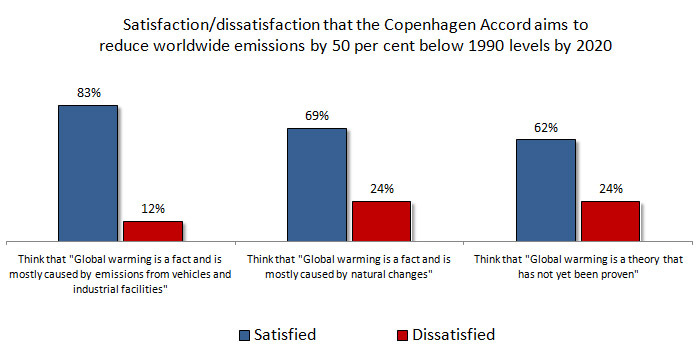 An Angus Reid poll published shortly after Copenhagen showed that there’s only a very weak correlation between stated belief in climate change, and desire to see it tackled. So, over 3 in 5 of those who say they don’t think global warming has been proven still want to see action taken to prevent it. My reading of this is that the numbers who say they do or don’t believe in climate change are relatively malleable. They get affected by levels of media coverage, by the weather, and the tenor of the debate between both sides of the climate argument. It takes longer for these views to translate into changes in willingness to take action, or to accept the government taking action. Nonetheless, it can eventually translate into a falling interest in tackling climate change. As I argued last week, it would be unsustainable for climate change to be a problem that is only ‘owned’ by government and other policy makers. If this one-off shift in attitudes isn’t reversed, or is repeated, there is a real risk that it will become a lot harder for the government to tackle climate change in a way that’s effective and sustainable. This entry was posted on Sunday, May 30th, 2010 at 14:34	and is filed under Climate Sock, Media. You can follow any responses to this entry through the RSS 2.0 feed. Both comments and pings are currently closed.